North of Dengchuan, the road from Dali enters another plain, with Yousuo as the commercial center. While Yousuo holds a big market, the main attraction is West Lake or Xihu on the western side of town. The Xihu area is somewhat unique in Yunnan as it seems to represent an earlier form of agricultural development, harking back to a time when not all the plains had been entirely drained of water. Closer to Yousuo the fields are high and dry, but further west the terrain drops slightly and gradually farming takes place on raised beds only slightly higher than the lake. Technically, at least during the wet season, the villages are islands, accessible only via bridges. Crops more suitable to wet conditions are grown closer to the lake and rice stands in water all the way to the harvest. 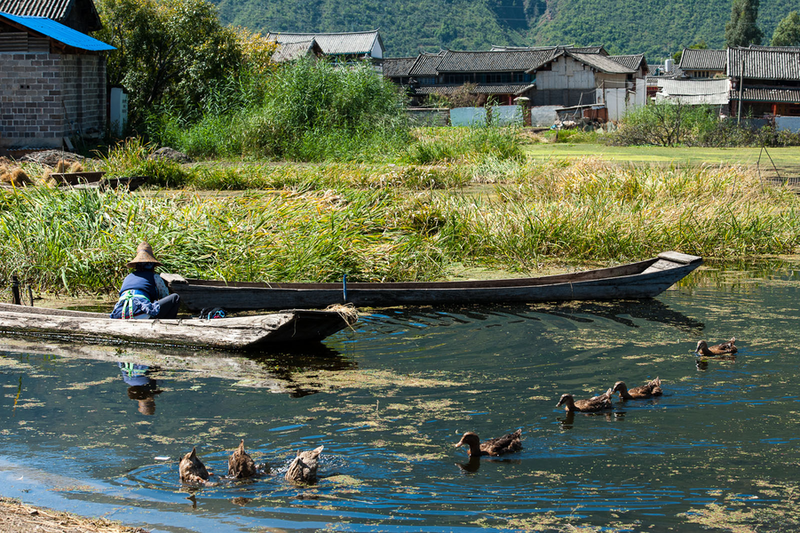 Fishing, collecting snails and keeping ducks are important additional sources of income. There are not really any tourist facilities at the lake, but it is possible to stay in Yousuo.